Espresso machines use a water tank, filter, and steam and hot water nozzles to dispense espresso and steam to froth milk for specialty coffee drinks such as cappuccino. While most espresso machines operate well with regular care and maintenance, if a clog occurs, it is necessary to thoroughly clean the unit to remove the clog and restore the unit to normal function. Note that it is best to clean the unit after every use while it is still warm as that is easier than trying to clean it when debris has hardened and cooled. 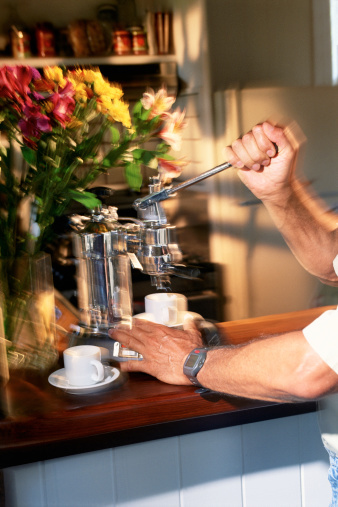 Coffee grounds and dried milk are common reasons why an espresso machine may get clogged. Open the filter holder and empty any coffee grounds out of the filter. Lift out the filter basket and rinse thoroughly. Set the filter basket back into place. Loosen the screw that holds the steam valve in place and pull down on the steam valve to remove the sleeve. Wash the sleeve with warm, soapy water and a cleaning sponge to remove any dried milk or other debris. Rinse thoroughly and dry with a towel. Fill a cup with water and immerse the steam wand into the frother. Turn the Steam Selector knob to the "Steam" setting and let the water froth for several seconds. If the nozzle will not steam, turn off the steam selector and use a straight pin to remove dried milk from the steam nozzle. Slide the sleeve back onto the steam valve and tighten the screw. Remove the waste unit from the espresso machine and hold the brew unit handle. Press down on the release button and pull the brew unit out. Clean thoroughly with warm water and a clean sponge but do not use dishwasher liquid. Clean the permanent filter located in the funnel with a clean, damp sponge to remove any coffee grounds. Dry the funnel and return the brew unit back into position. Descale the unit by filling the water tank with clean water. Add descaling tablets, available through the espresso machine manufacturer, to the water and close the water tank. Set the program selector to "Program" and then choose "Descaling" from the menu. Press "Start" or "Begin" and set a large container under the water nozzle. Remove the steam nozzle sleeve. Fill a pitcher with cold water and turn the Selector Knob to the "Steam" symbol while the descaling solution is processing. Immerse the steam nozzle into the pitcher and allow steam to run for 30 seconds. Repeat three times to decalcify the nozzle. Turn off the steam nozzle and wipe the nozzle dry with a towel. Contact the espresso machine manufacturer for advice about the specific model if the above troubleshooting steps do not resolve the problem.